I sometimes mention in my stitch videos that a stitch has sloppy edges, and you may want to add a border depending on what you plan to use the stitch for. I've often been asked exactly how to add a border - so here is a series of videos showing how I do it. 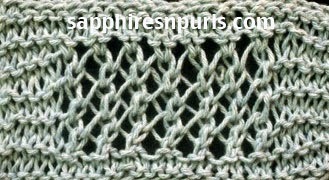 I almost always use a seed stitch border, but a garter stitch border is also attractive. A border not only neatens up the edges, but it can also help a curly stitch lay flat (think stocking stitch). There may still be some curl left, but a border can help. You may also want to consider slipping the first stitch for an extra neat edge. All you really have to do is cast on extra stitches to be used on either side, and knit a few rows in the same stitch before beginning the stitch pattern, then a few more rows before binding off. It really is that simple. I do recommend you swatch before starting your project, to make sure you like how everything looks. Let's say you want a garter stitch border along the sides that is six stitches wide. Your stitch pattern, however, has you knitting the first two stitches on both the RS and WS. Those two stitches are going to add to the six stitches you have designated for your border, making it look wider. Or, on a stitch I swatched around with recently, there was one stitch along the right side of the fabric that was knit on the RS and purled on the WS, which created a line of stocking stitch. It looked a little funny, so for that example I would probably add another stitch to the left side of the fabric, to recreate that line of stocking stitch so both edges look the same. Or maybe, your stitch pattern has a few rows of garter stitch at the beginning of the pattern, that isn't repeated for the last few rows. That would make the border wider at the bottom than at the top; in that instance, you could add more rows of garter stitch to the top before binding off. Don't be afraid to play around with stitches to achieve a look that you like. It's also ok to try omitting a stitch or two if it won't change the look of the overall pattern. Again - this is why swatching is important before starting your project. It is never fun to put hours of work into something, only to realize that it doesn't look quite right and you have to rip back and start over. At this point, I have three videos in mind. I may add one or two more in the future, though. The thing I like about these, is they look the same on both sides, so there is now worry about what side your stitch pattern starts on. I just used a yo-k2tog pattern for this example. That is repeated for all rows, and makes for some pretty sloppy edges as you can see in the picture above. To add the Garter Stitch Border, I added 8 extra stitches - four for each side, plus I knit three plain rows before starting the stitch pattern and three plain rows before binding off. Here is the video - Happy Knitting!